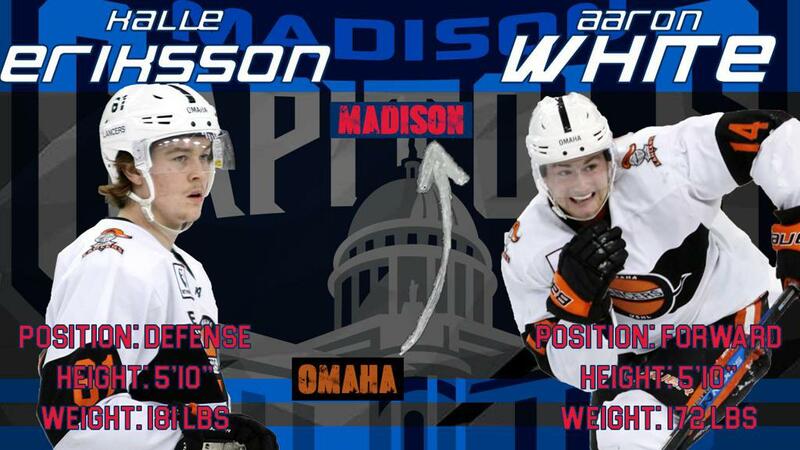 Middleton, WI – The Madison Capitols acquired two active players from the Omaha Lancers early Thursday morning. Madison obtained forward Aaron White and defenseman Kalle Eriksson from Omaha, along with affiliate list defenseman Greg Japchen and a 2019 Phase 1 - 7th round pick. In exchange for the players and draft pick, the Lancers received a 2019 Phase 1 - 3rd round pick and a 2019 Phase 2 - 6th round pick from Madison. “We’re excited to get two great players to add to our roster,” says head coach Garrett Suter. “Aaron put up some good numbers in the BCHL, and has played well in Omaha. It’ hard not to be happy with getting a committed defenseman when you’re shorthanded on d-men as well”. Madison has only had six defensemen rostered since Trey LaBarge was traded to Kenai River. Eriksson has racked up 13 points (1-12-13) as a defenseman in the league, and recently committed to the University of New Hampshire. White played parts of the last two years for the Surrey Eagles in the BCHL, accumulating 27 points in 53 games. Out of those 27 points, 16 were goals to go along with 11 assists. This season, White has picked up six more points (1-5-6) in 16 games with Omaha. The Capitols return to action tomorrow night as they take on the Muskegon Lumberjacks on the road at L.C. Walker Arena in Muskegon. Puck drop is set for 6:15 pm CST with all the action on hockeytv.com. Madison will return home on Saturday, January 5th for the 5th annual Be The Miracle Night, loaded with specialty jerseys and a Mark Johnson Bobblehead Giveaway. Don’t miss out on any of the action this season as the Capitols embark on their 5th season in the USHL. Ticket packages, suites, and group outing are available now at www.madcapshockey.comor by calling the front office at (608) 257-2277.